Sometimes the name of a dish will draw me in. It paints a picture of what the final dish will look like. And if said name includes certain key words, such as “creamy, bacon, cheesy, or pork”, chances are I’m gonna read the recipe. Then comes something called Bruschetta Salmon and I was stumped. Was this toast with salmon on it? Were they substituting the salmon for the bread in some paleo-gone-wild attempt at an appetizer? How would that work? Then I actually read the recipe and understood. It’s basically salmon with all the flavors of a typical bruschetta used as a topping. What a great idea! And I might add, what a tasty, quick dinner! A word of warning for the faint of heart: this fish dish has cheese in it! I know, I know…. blasphemy, right? Wrong! It’s good. Get over it. I’ve never quite understood the rule about no cheese with fish or seafood. I’m sorry, a tuna melt? Hello? Enough said. This tasty little rule-breaker of a recipe comes from Delish.com. It’s quick, it’s cheerful, it’s dang yummy and I will definitely be making it again soon. Silly name and all! In a large skillet over medium heat, heat 1 Tbsp olive oil. When oil is shimmering but not smoking, add salmon skin-side up and cook until deeply golden, about 6 minutes. Flip and cook 6 minutes, until salmon is opaque and flakes easily. Transfer to a plate. Serve salmon with tomato mixture spooned on top. Garnish each serving with basil and parmesan, then drizzle with balsamic glaze. This is the time for comfort food. The weather is cooling off, its getting dark earlier and earlier, holiday planning has begun and when it all gets a bit overwhelming, it’s nice to dive into a big bowl of comfort. I don’t know about you, but when I think “comfort food” two things instantly come to mind: Cheese and Pasta. The good news is both of those can easily be had with mac-n-cheese. The bad news is you never feel good about diving into a big bowl of mac-n-cheese. That is, perhaps, until now. Roasted Veggie Mac and Cheese takes the regret out of cheesy mac-n-cheese. And, if you’re like me and truly love roasted vegetables, it doesn’t even seem like you’re making a sacrifice to “healthy-up” a bowl of pasta and cheese. The vegetables take up a lot of valuable “real estate” in your bowl, so you wind up using and eating a lot less pasta. Also the veggies fill you up and keep you satisfied longer than a vat of pasta. It’s a win-win-win kind of situation. The recipe comes from Cooking Light Magazine, and the only concession I made was to use regular pasta instead of whole-grain. I still can’t go the whole-wheat route with pasta. I’m getting enough fiber from all these tasty veggies so I can enjoy my good old-fashioned pasta without feeling bad. 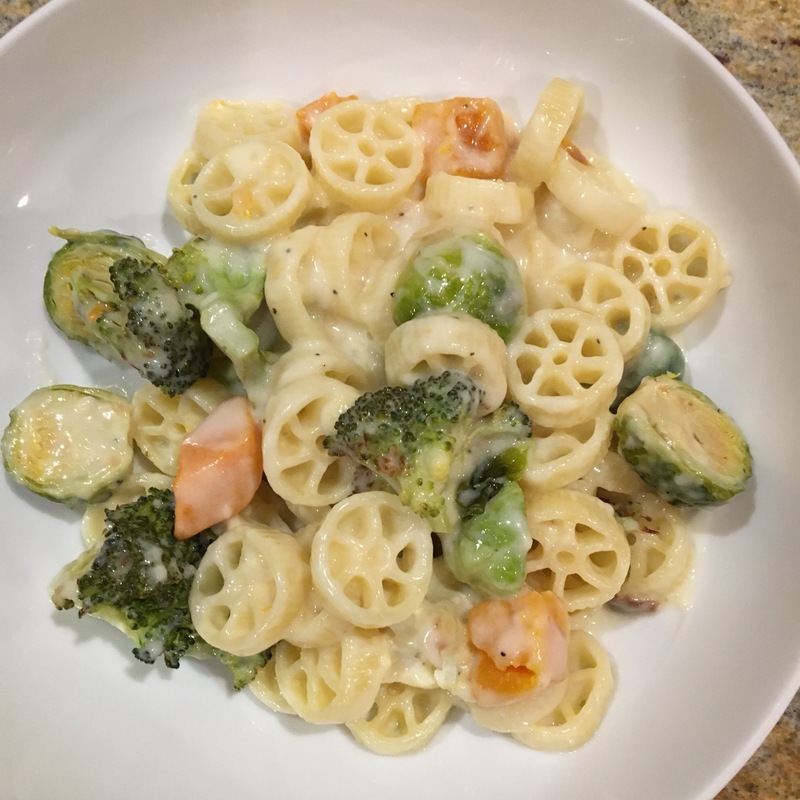 I did swap out the boring elbow macaroni for the more interesting and fun wagon wheel shape. They seemed to better fit the size of the veggies. What? Don’t you match up your pasta to what else is in the recipe? So the next time you need to curl up on the couch with some serious comfort food, try this mac-n-cheese and come away feeling a bit better about yourself! Preheat oven to 425°F. Line 2 large baking sheets with aluminum foil, and coat with olive oil spray. Toss broccoli, cauliflower, squash, and Brussels sprouts with olive oil, and season with salt. Spread vegetables in an even layer on prepared baking sheets. Bake at 425°F for 25 to 30 minutes, stirring vegetables and rotating pans halfway through cooking time, until vegetables are soft and have begun to brown around the edges. While vegetables roast, bring a large pot of water to a boil. Cook pasta according to package directions, omitting fat and salt. Drain, and set aside. Melt butter in a medium saucepan over medium. Add onion, and cook over low about 2 minutes. Add flour, and cook another minute or until the flour mixture is golden and well combined. Add milk and broth; whisk, increasing heat to medium-high until mixture comes to a boil. Cook about 3 to 4 minutes or until it thickens slightly, and then season with pepper. Remove pan from heat; add cheeses, and mix well until cheeses are melted. Add cooked pasta, and mix well; fold in roasted vegetables. Weekly Winner: Sometimes the best plan is no plan at all … And bacon cheese! As my lack of entries indicate, it has been a crazy couple of weeks around here…. Work, house guests, burst pipes, new carpeting, travel….so my recipe experimentation has been relatively nonexistent. Hopefully I’ll be able to remedy that in the coming weeks but for now this is definitely the best thing I’ve made in a while. Heading to the Green City Market this morning I had no idea what I was looking for. I found myself in the unusual situation of only having to buy for myself and hubby and today’s lunch was all I had in mind. But what to make? I’m sure I have a ton of new salad recipes I’ve been meaning to try, and there’s always my famous (to us anyway) farmer’s market pizza but to be honest, I wasn’t going to have the time. I needed to find something that could be put together quickly but obviously, it had to be tasty. If I can just say…I outdid myself! I thought at first I would just cobble together a salad from all the various fabulous veggies I knew would be waiting for me. But then again, there’s Bennison’s bakery which always has incredible bread. And cheese…there’s always amazing cheese to be found there as well. Voila! 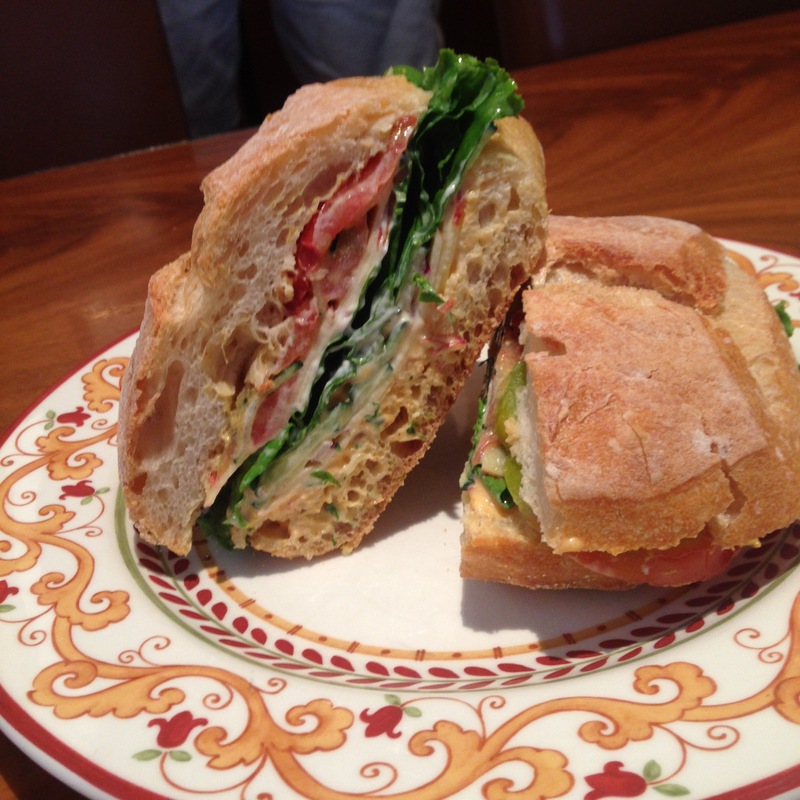 A Veggie Sandwich! This was great, or as hubby said “This is stupidly good”. I’ll take that any day of the week! Sometimes you just got to wing it. Take 2 mini ciabatta loaves and slice in half lengthwise. Generously spread bottom halves with Bacon Cheddar Cold Pack Cheese from Brunkhow Cheese . On top of that place gala apple thinly sliced, half a cucumber thinly sliced, one sliced heirloom tomato, red leaf lettuce and thinly sliced red onion. Salt and pepper each sandwich. Spread a thin layer of Gulden’s mustard on top half of bread, place on top of the glorious veggies and squish down firmly. Cut each sandwich in half and enjoy! Weekly Winner: Cheese! Beer! Soup! What’s better than soup on a chilly night? Cheesy Soup. And what makes cheese soup even better? Well yes, bacon would definitely make it better but that’s a different recipe. This time, it’s Beer! I pulled this recipe back in the depths of winter, certain that it would get made within a week or so. Well, life got in the way and it got tucked away – that is until a few days ago. It was a typical chilly early spring night and the perfect time to pull this out and give it a try. I knew we’d like it…seriously, what’s not to like? Lots of cheese (including one of my personal favorites, smoked Gouda), beer….and a pretzel garnish. As with many of the great recipes, this one wound up far greater than the sum of its parts. Tasty parts for sure, but the finished product was down right decadent and luscious. And very, very cheesy. I’m not certain, but I think that I got this recipe from Cuisine at Home. Regardless of where it comes from it has found a permanent home in my Soup recipe file. Melt butter in a large pot over medium-high heat. Add onions, carrot, and celery; cook until onions soften and begin to brown, 7-9 minutes. Add garlic and cook until fragrant, 1 minute. Stir in flour and cook 2 minutes, stirring often. Slowly whisk in broth, milk and beer. Bring mixture just to a boil; reduce heat to medium and simmer until vegetables are very soft, about 20 minutes. Off heat, puree soup with a handheld blender. Return soup to stove top over medium-low heat. Toss cheddar and gouda with cornstarch. Whisk cheese mixture into soup, by the handful, making sure the cheese is melted before adding more, then whisk in cream cheese until melted. Off heat, stir in Dijon, Worcestershire, and paprika; season soup with salt, pepper, and Tabasco. Garnish each serving with pretzel nuggets. Lately, I’ve been somewhat obsessed with Indian food. I crave it. It is a fairly new discovery with me as far as home cooking is concerned. I’ve always enjoyed going to Indian restaurants and I do make a fairly awesome Chicken Tikka Masala (if I do say so myself), but that has pretty much been it. Until now. I’m now collecting recipes like mad and experimenting with Indian spices in everyday cooking. At the same time, hubby has become obsessed with making his own cheese. I know, I’m a lucky woman. Mozzarella, ricotta, you name it, he’s been tinkering with it with great success. 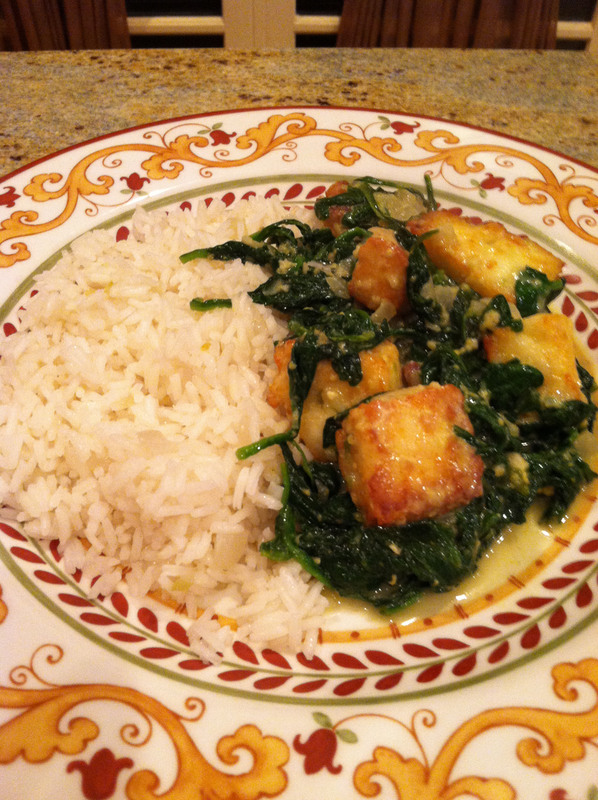 Which brings us to a recent, cold, Sunday evening and this week’s Weekly Winner — Saag Paneer. 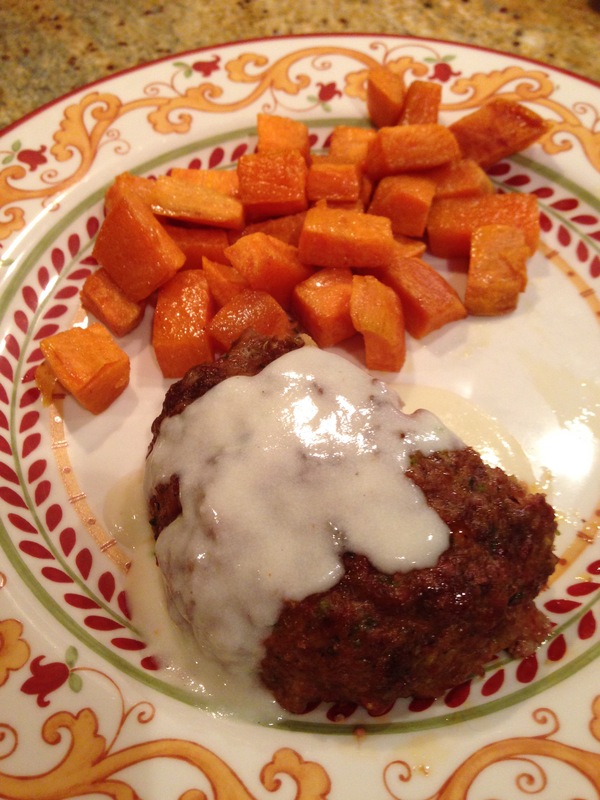 Indian food and homemade cheese… ding, ding!! We have a winner! The recipe comes from Food Network Magazine and while a bit time-consuming is actually quite easy … and most delicious. Make the cheese: Line a colander with a double layer of damp cheesecloth; put in the sink. Bring the milk to a simmer in a wide nonreactive pot over medium heat, stirring occasionally with a wooden spoon. Remove from the heat and stir in the yogurt, lemon juice and 2 teaspoons salt. Continue to stir gently until large curds form and separate from the whey, 1 to 2 minutes. Strain through the cheesecloth-lined colander, discarding the whey. Gather the ends of the cheesecloth and twist to squeeze out any excess whey (run the sides of the bundle under cool water if it’s too hot to handle). Tie the ends of the cheesecloth around a wooden spoon handle and lay the spoon over the colander, letting the bundle dangle; let drain, 10 minutes. Untie the bundle and twist the cheesecloth again, squeezing out any more whey. Lay the bundle on its side on a plate. Top with another plate and weigh it down with a large can. Refrigerate until a firm cake forms, about 1 hour; unwrap and refrigerate in an airtight container until ready to use, or up to 2 days. Fry the cheese: Cut the cheese into 3/4-inch cubes. Toss in the flour until well coated, shaking off any excess. Heat about 1/2 inch vegetable oil in a medium skillet over medium-high heat until shimmering. Carefully add the cheese and fry, turning occasionally, until golden brown, 2 to 4 minutes. Remove with a slotted spoon and drain on paper towels. Season lightly with salt and set aside. Make the spinach: Bring a large pot of generously salted water to a boil. Working in batches, cook the spinach until just tender, about 30 seconds. Remove with a slotted spoon and transfer to a bowl of salted ice water. Drain and squeeze dry, then chop and set aside. Pulse the ginger, garlic, jalapeno, coriander, cumin, turmeric and 1/2 teaspoon salt in a food processor until finely chopped. Whisk the yogurt, 1/4 cup water and 1 teaspoon salt in a small bowl. Heat 2 tablespoons butter and the vegetable oil in a wide pot over medium-high heat. Add the onion and cook, stirring, until deep golden brown, about 10 minutes. Add the ginger mixture and cook, stirring, until toasted, about 5 minutes (add a splash of water if the mixture is sticking). Reduce the heat to medium low; add 1/2 cup water and scrape up any browned bits, then add the cooked spinach and stir until heated through, about 4 minutes. Stir in the yogurt mixture and simmer gently until slightly thickened, about 5 minutes. Add the fried cheese and the remaining 2 tablespoons butter and cook, stirring, until heated through, about 1 minute. Season with salt.